李书蓉, 蒋欢军. 带可更换连梁的新型联肢剪力墙的设计与分析[J]. 同济大学学报(自然科学版), 2018, 46(7): 868-876. DOI: 10.11908/j.issn.0253-374x.2018.07.002. Abstract: In this study, a new kind of coupling beam is proposed, which is composed of non-replaceable part and replaceable part. During earthquakes, the replaceable parts yield first and the non-replaceable parts remain elastic. The design method of the new replaceable coupling beam is introduced. The numerical simulation and comparison analysis are carried out. The results show that under minor earthquakes, the replaceable parts remain elastic. Under moderate earthquakes and major earthquakes, the replaceable parts yield first and the damage of the new coupling beams concentrates on the replaceable part. Compared with the traditional reinforced concrete coupled shear wall, the seismic performance of the new coupled shear wall is improved significantly. 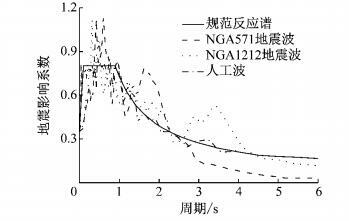 Finally, the relationship between the deformation of the replaceable part and inter-story drift ratio is proposed, providing the basis for the design of the replaceable part. 设计一片15层的钢筋混凝土联肢剪力墙，一层层高3.6 m，其他楼层3.15 m，共47.7 m.抗震设防烈度为7度，场地类别为Ⅵ类，设计地震分组为第一组，特征周期0.9 s.左右墙肢高度分别为2 500 mm、2 400 mm，约束边缘构件形式为暗柱，墙肢尺寸和配筋见表 1.连梁跨高比为2.875，连梁尺寸及配筋见表 2. 根据提出的设计方法，金属阻尼器选用YL100钢材，腹板尺寸为13 mm×100 mm，2个腹板并联，翼缘尺寸为20 mm×100 mm，阻尼器长度为270 mm，受剪屈服力为184 kN，将传统连梁全部更换为新型连梁，带有软钢阻尼器的新型连梁与传统连梁的刚度比为0.94. 根据场地条件和结构动力特性，在PEER强震记录数据库选取了2条天然波，天然波信息见表 4.表中, EW、E均为地震波分量的代号.选用人工波生成软件Simqke，通过输入设计反应谱生成人工波.本工程抗震设防烈度为7度，多遇地震、设防地震、罕遇地震作用下的加速度峰值分别为0.35、1、2.2 m·s-2.图 5为地震波反应谱与7度小震的规范设计反应谱的对比. NIED and NEES Consortium. Report of the seventh joint planning meeting of nees/e: defense collaborative research on earthquake engineering[R]. Berkeley: University of California at Berkeley, 2010. KIM H J, CHOI K S, OH S H, et al. Comparative study on seismic performance of conventional RC coupling beams and hybrid energy dissipative coupling beams used for RC shear walls[C/CD]//Proceedings of 15WCEE, Lisbon: [s. n. ], 2012. LYONS R M, CHRISTOPOULOS C, MONTGOMERY M S. Enhancing the seismic performance of RC coupled wall high-rise buildings with viscoelastic coupling dampers[C/CD]//Proceedings of 15WCEE, Lisbon: [s. n. ], 2012. 中华人民共和国住房和城乡建设部. 高层建筑混凝土结构技术规程: JGJ3—2010[S]. 北京: 中国建筑工业出版社, 2010. Ministry of Housing and Urban-Rural Construction of the People's Republic of China. 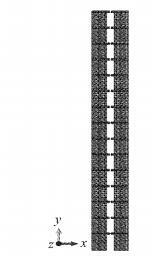 Technical specification for concrete structures of tall building: JGJ3—2010[S]. Beijing: China Architecture and Building Press, 2010. ANSI A. AISC 341-10 (2010). Seismic provisions for structural steel buildings[S]. Chicago: American Institute of Steel Construction, 2010. 中华人民共和国住房和城乡建设部. 混凝土结构设计规范: GB50010—2010[S]. 北京: 中国建筑工业出版社, 2010. Ministry of Housing and Urhan-Rural Construction of the People's Republic of China. Code for design of concrete structures: GB50010—2010[S]. Beijing: China Architecture & Building Press, 2010. 中华人民共和国住房和城乡建设部. 建筑抗震设计规范: GB50011—2010[S]. 北京: 中国建筑工业出版社, 2010. Ministry of Housing and Urban-Rural Construction of the People's Republic of China. Code for seismic design of buildings: GB50011—2010[S]. Beijing: China Architecture and Building Press, 2010. BIRTEL V, MARK P. Parameterized finite element modeling of RC beam shear failure[C]//2006 ABAQUS User's Conference. Taiwan: [s. n. ], 2006: 95-108.